We kicked off the first of our PlaySmelter readings with a unique situation: Kristin Shepherd’s raw talent led her straight from page to stage, as her first play $38,000 For A Friendly Face won the 2007 Samuel French Canadian Playwright’s Contest without experiencing the full developmental, dramaturgical process. In our experience, the typical playwright trajectory involves first draft, dramaturgy/workshop and hopefully into production, but Shepherd carved her own path. 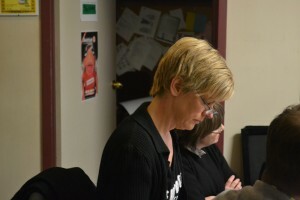 We were keen to give Shepherd the full spectrum of the process, and she was keen on learning a new approach to playwriting, so we all met around the boardroom table at the Sudbury Theatre Centre to read and discuss Hope Op. Hope Op is a play that enjoyed a successful run at the Gateway Theatre in North Bay, and it focuses on how four women cope with the perils and pitfalls of middle age until one day they decide to rebel: they organize a heist at the local Sobeys. One of the first things that came out of our discussion was the notion of monologues and direct address. It was important to our playwright that each of the four main characters had a moment to express what they were really thinking and feeling. The monologues also serve as juxtaposition to the play’s comedic nature; the individual monologues are darkly comedic in their truth, but also sad and honest. We were intrigued: why did each character need their monologue? Did they demand it? What was the trigger event that led to the monologue? Throughout the course of the play we made further discoveries about the characters that were absent in their monologues, so the notion of truth came up. Were those monologues meant to be a moment of pure truth? Are the characters aware they’re sharing this to an audience or is it something that is meant to be private? What is bursting to come forward at this moment in time? Our playwright instinctively felt strongly about the monologues, so we discussed how to weave them organically into the play. The idea of each character having a solo in a symphony was used as a metaphor for structuring monologues within the framework of Kristin’s plot. A longer time frame would have allowed us to read the play absent the monologues and then read the monologues together as a unit and make further discoveries. As we explored the private thoughts of these women, we also began to discuss how those private feelings manifested themselves within a group dynamic. The bonds of sisterhood and female friendship are unique, but why? Why do these four women, in particular, need each other? Does something tie them together other than a shared history and proximity? Women of a certain age are often absent on our stages, so Kristin felt it was important to share their stories, to remind people there is a stage between ingénue and grandmother.